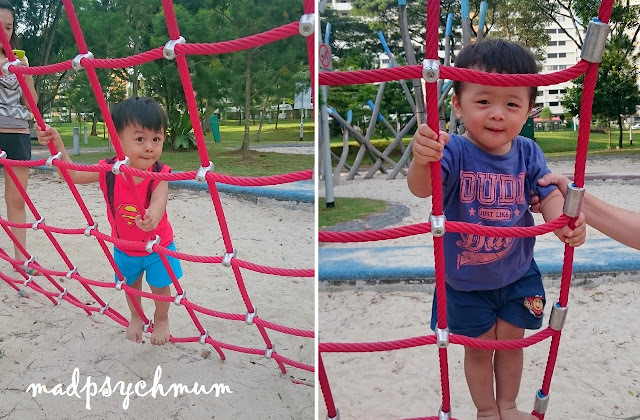 We finally brought our kids to visit Bishan-Ang Mo Kio Park a few weeks ago with our friend Jess and her boy, Baby Boy's buddy. The park was so big that I couldn't decide which part of the park to go. 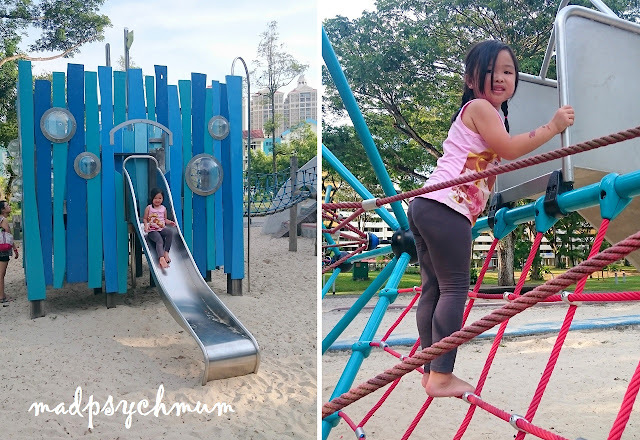 According to fellow resourceful mum bloggers who live there, the park is broken down into two parts: half with a large dry playground, pond and water playground and half with the dog park, river, smaller playground and McDonald's. I thought it was unrealistic to go to both (although we did anyway as you are about to find out) so we made an executive decision to go to the park with McDonald's as my impression when we were there previously is that the park is smaller and more manageable. Our first stop was of course the famous river that was developed from a canal, a project that won PUB the gold award at the Public Service 21 Excel Convention 2013 (a project that I worked on got bronze that year so I was there to witness PUB's presentation). It was amazing how PUB was able to transform an ugly canal into a beautiful river teaming with life and yet could still fulfill its original function (of directing water to the sea to prevent flooding). As we walked to the small playground, we discovered to our horror that it was under construction! "What?!" I exclaimed. Not wanting to give up (I can be ridiculously persistent! 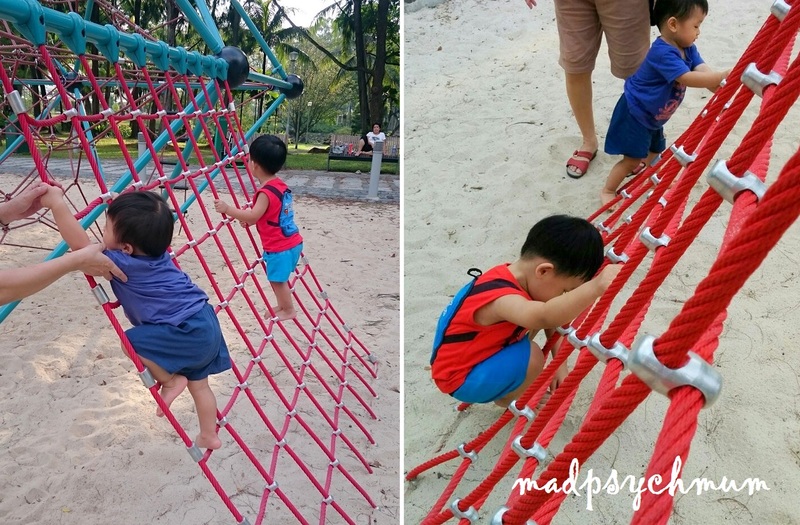 ), I convinced our group to walk to the other part of the park where the bigger playground is. Along the way, we passed the water playground that is only in operation on Thursdays to Sundays. Although we already knew it wasn't operational before this but seeing it empty really increased the level of disappointment that I felt. There was still a long distance to walk so we decided to sit by the pond and chit chat while we rested and had some snacks. I actually suggested taking a bus to the playground but when I checked the bus stop, there was only one bus and it didn't seem to go to the playground! Very strange considering that the playground was only 2 bus stops away! After a very long walk, finally, we caught a glimpse of the playground! We have arrived! My girl had some difficulty climbing up but after much encouragement, she managed to do it. Proud of her! 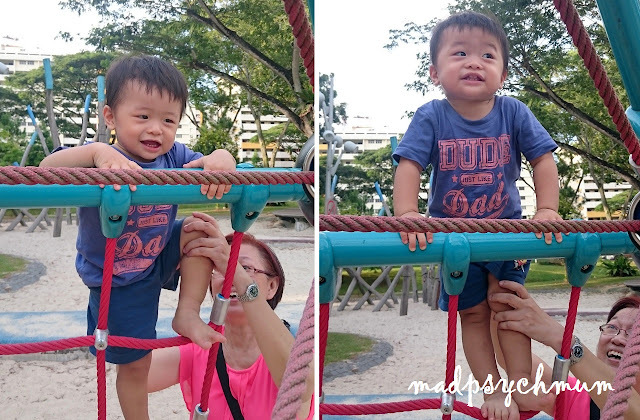 Baby Boy got so good at climbing the ropes that he didn't need much help later (of course I didn't take any chances just in case he slipped) and even managed to slide down the metal slide by himself. To be honest, I was torn between wanting to allow him to try things out on his own and my fear of him falling should he fail *sigh*. Thankfully he did not get hurt.